Chris (who has provided TF news in the past) is reporting that he has learned that Susan Blu is the voice of Arcee and Jason Griffith is the voice of Sideswipe in Transformers: Revenge of the Fallen. Oddly enough, despite all the premieres, the voice actors is something no one is catching so don't have direct proof. However, both are experienced voice actors with a long list of credits. Susan Blu has multiple Transformers ties. 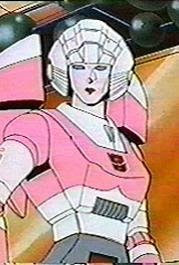 The primary for Transfans is the voice of Arcee in the animated Transformers: The Movie and the third season of the TV series and also did a voice in Beast Wars, and reprised Arcee for Transformers: Animated. She was also voice director of Beast Wars and TF: Animated. Jason Griffith is most notable for his role as Sonic for the cartoons and video games and this would be his first work for anything Transformers related. Finally! A good voice actors has finally surface. But who else is voicing the bots? I know there's Mike Patton is voicing Mixmaster and Tom Kenny is voicing Wheelie and the Twins. Who else is there? Guess have to wait for the news. This makes me happy. Susan Blu has earned her stripes and I love they they have asked her to be involved. Hey Anthony Anderson voices Jolt! go 2 Imdb.com and have a look! at least she was smart enough to reprise her G1 role in the movie! I hope this info is correct because TFW2005 reported it so this means business. at least she was smart enough to reprise her G1 role in the movie!" She was voice director on Beast Wars, and voiced Transmutate in one episode. For the record, Beast Wars is the best-written Transformers cartoon yet made. I've been a staunch Transformers fan for 25 years, reading the comics before the cartoon had even aired, so I find I'm well placed to make such statements... I've never cared for Geewun snobbery (above all else, I love the G1 Marvel comics, but am not narrow-minded enough to dislike everything else without weighing up the pros and cons of each...). Incidentally, I would have loved for Rene Auberjonois to have had a role in the movie. Bah. Remind me, who's Tony Todd playing again?